The Intel Celeron CPU series has always been marketed towards budget PCs and notebooks due to the average performance and speeds of the processors. 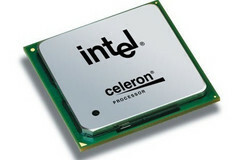 The latest additions to the Celeron family ready for release are the ultra-low voltage (ULV) Sandy Bridge-based Celeron 787 and 857 cores. Both chips are manufactured under a 32nm process with a max TDP of 17 watts each. According to Laptoping, these two particular Celerons have been listed on Intel’s website since mid-July, although no known notebooks or desktops are currently shipping with the new CPUs. The 1.3GHz single-core Celeron 787 is expected to ship with 1.5MB L3 cache and an on-die Intel HD Graphics clocked at 350MHz or up to 950MHz maximum. While the addition of the integrated GPU is new for the lineup, it shouldn’t be too surprising since these Celerons are built with the Sandy-Bridge architecture in mind. Intel could potentially be bringing the cost-saving and energy reduction design to future Celerons as well. Meanwhile, the 1.2GHz dual-core Celeron 857 is expected to ship with 2MB L3 cache with similar integrated graphics as the Celeron 787. Being budget notebook chipsets, don’t anticipate the new Celerons to support Hyper Threading or Turbo Boost despite their similarities to the Sandy Bridge architecture. The Celeron 787 and 857 are launching sometime this third quarter and will cost manufacturers $107 and $134, respectively.